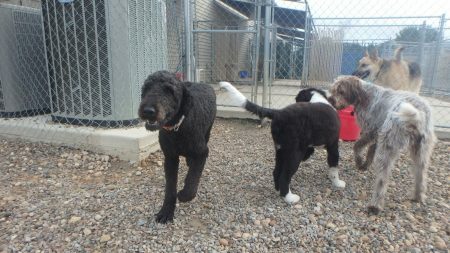 Three cheers for Elroy M (Labradoodle) as he celebrates his 3rd birthday at Just Dogs PlayCare! Elroy took a short break from playing with his party guests, NaBu (Bernese Mountain Dog / Newfoundland puppy), Tilly S (Wirehaired Pointing Griffon), and Cooper F (German Shepherd), to mug for the camera. Happy Birthday, Elroy, from all your human and dog friends at JDPC!